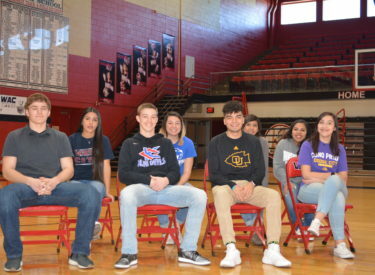 Eight LHS student athletes participated in Liberal High School’s signing ceremony Wednesday afternoon as part of National Signing Day. Daniel Wehling signed with Concordia University in Nebraska. He was a first team all WAC football player and cpatain this fall. He was the program’s lineman of the year and played varsity all four years. Cameron Riley signed at Kansas City Community College’s golf program. Riley took 4th at state golf last season. He has made state all four years. He is a three year scholar athlete and four year all WAC Academic Team recipient. He was the Junior Athlete of the Year at LHS. Alex Carrasco signs in the golf program at Ottawa University after lettering three years at LHS in boys golf. Michelle Herring signs for track and field at Dodge City Community College. She is a four year varsity thrower in the discus at LHS. Anna Tovilla sings for the golf program at Johnson and Wales University in Denver. Three girls soccer players signed. Johaly Portillo singed at Garden City Community College. She is a four year varsity player. Alondra Alvarado also signed at GCCC. She is a four year starter and four year varsity player for LHS. She won the Lady Red Award in soccer last season. She is a two year captain in soccer. Mariyvette Aguilar signed in the soccer program at Pratt. She was named Liberal’s Most Improved Player after last spring. She is a three year varsity player for the Redskins. All of their interviews air during the Sportsguys Thursday morning between 7:37-9 on 1270 and kscbnews.net.